Luxury bayfront home with glorious water views from every window. 3,600 sq ft of splendor perched on a cul-de-sac in a 21-home gated executive community. Up to 10 vacationers can enjoy five decks, screened porch, gas grill, whirlpool tub, wireless internet, computer and epic views that go on forever. This home delivers luxury and convenience whether you favor the private pool, tennis/basketball court, the award-winning beach, exploring, or just chilling out with your sundowner in an aquatic wildlife setting. Expect much. The home is offered July, August, and September and maintained to the high standard of a private executive residence. The waterfowl greet you to start your day as you sip your beverage perched high over long water views. The open floor plan and large kitchen island is perfect for your breakfast and snacks, and every window displays pristine bay scenes. The multiple decks and screened porch are adorned with relaxation seating for everyone. Throughout the day you observe shore birds and other wildlife go about their business in their natural habitat, and yet you are only a 7 minute walk to the ocean beach. 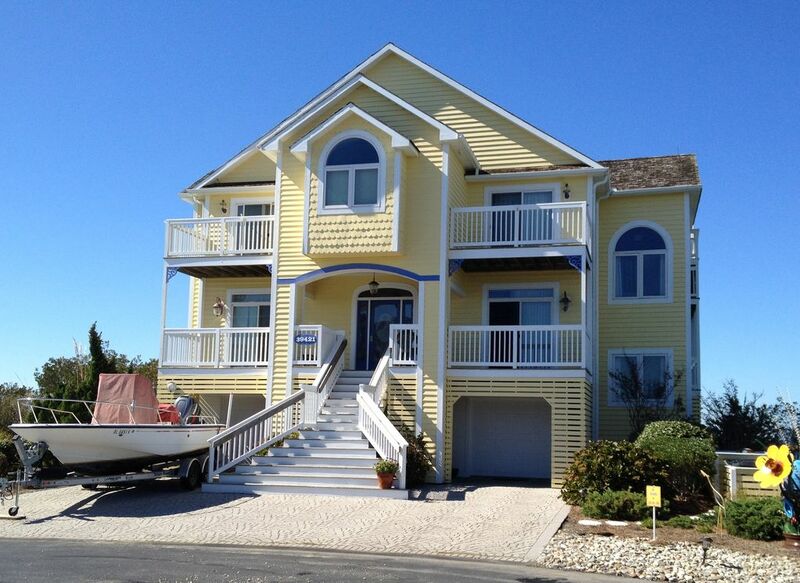 Waters Edge features 4 bedrooms and 4.5 baths and sleeps 10 people. The master bedroom has a king-sized bed, walk-in closet, balcony and private bathroom with whirlpool tub. Every bedroom enjoys the tranquility of a natural water view. Expect more when you are our guests. We provide starter paper products (paper towels and t-paper) as well as hand soap, dishwasher, and laundry detergent. Also, there is no cleaning fee. Additional amenities include a wet bar and refrig, large capacity Keurig coffee brewer, multiple large flat screen HDTVs with satellite DVRs, and whole-house WIFI with a computer, a spectacular glass office, elevated captains walk, private outdoor shower, and lending library. Our nearby service coordinator is available to arriving and departing guests to deal with any unique situations as you begin your concern-free visit. We tried to think of everything ... even a dumbwaiter for grocery deliveries. Multiple size bikes are available. A beach buggy and beach chair sare dedicated for your use. Should the few hundred steps to the award-winning beach be too far, consider the large, uncrowded pool located minutes away from the home, where abundant chaise lounges and sunbrellas along with professional landscaping offers a lazy oasis from reality. The Cove community supports only 21 luxury homes, so amenities such as the private pool and tennis/basketball court are never crowded. Our home sits on a one-area parcel which is manicured and surrounded by water on three sides. Did I mention the birding? The adjacent towns of Bethany, Dewey, Rehoboth and Ocean City, MD are reachable by bike or car. Have a culinary affair at the Culinary Coast. This region supports 100 restaurants to the north, and 100 dining venues to the South. Delaware is home to tax-free shopping and the endless outlet malls in nearby Rehoboth Beach offer plenty of upscale shopping opportunities. The nearby Indian River inlet marina offers charter boat fishing, boat launch and docking services, dining, and a fish store selling fish right off the boat. Join us for your next vacation and visit the award-winning beach and bay of Waters Edge. This 21-home private, gated executive community offers a private pool and tennis/basketball court. The beach for swimming, sunning, surf fishing, shell treasures and bird watching is nearby. Wander for miles in the adjacent DE Seashore Park. Biking (bikes are provided) and hiking are yours for the asking. Or just relax, eat, read, sleep, sun and veg out in screened porch or outside decks. ACTIVITIES ON_SITE: Cruise the bay in a kayak or raft. Crabbing, clamming, fishing and bird watching in the nature preserve back yard on the property. Biking and hiking are yours for the asking. Or just relax, eat, read, sleep, sun and sip while you enjoy the panoramic views high off the Captains Walk. We love North Bethany Beach, a true quiet resort area. Executive living at its finest in a gated community with easy access to a rich variety of activities in the immediate area. This includes a private swimming pool, tennis/basketball court, nearby sparkling ocean beach, the slow culture of Southern Delaware and racy Ocean City, MD. Did I mention birding, and discount shopping - plus no sales tax? While we love living just outside Philadelphia, PA, its such a treat to come here. Our 7 grandchildren love it too. We've flunked retirement twice, attained degrees from Drexel University and generally appreciate every minute of life we can. North Bethany is a high value up-and-coming area which is almost fully developed yet outside the city limits. We wanted a place where we could be on the bay to observe nature at its best (we've even seen seals) but within minutes walking distance of the beach and also I could walk to get a cup of coffee to a small restaurant is nearby. We get all three in Waters Edge plus a gorgeous home with relaxing water all around. You are welcome to come and share it with us. Situated on a one acre private peninsula, surrounded by tidal water on 3 sides. Throughout the day you observe shore birds and other wildlife go about their business in their natural habitat. The beach sunsets are varied and simply spectacular, made even better on the deck with a Sundowner drink in hand. Privacy galore. 4 full bathrooms, 1 half-bathroom Private Outdoor Shower with seating area and southerly water view. Located on the Bay side on a slim barrier island, at Beach Cove, and surrounded by water on 3 sides and a short 0.3 miles walk from the sandy beach. Every window has a water view. One acre, surrounded by the tidal salt water of Beach Cove on 3 sides. You can fish directly off the property. Tour the pristine wetlands section of the property. Two independent HVAC systems, whole house cooling and heating. Additional cooling in the glassed-in office on the upper level. Dining seating area for 10 and parallel to windows with very long water views and spectacular sunsets. (2) Two large flat screen High Definition TVs, wall mounted, with Digital Recorder (DVR) feature. Premium channels such as HBO, Showtime, etc. Library of assorted DVDs and video tapes. Can launch own kayak directly from the property. Kayak is not provided. Some life jackets are available. Screened-in porch overlooking Southerly water views of Beach Cove. Seating provided. (3) Wide decks on all floors overlooking gorgeous long bay views with chairs and hammock. Well suited for relaxation and sunset-watching. Full size outdoor tennis court with wind barrier in the community and walking minutes away. Multiple golf courses nearby in DE and MD. Details in regional golf publications. Large Pool area exclusively for gated executive community with bathroom and rest facilities. Also an exclusive Tennis and Basketball court. Also an outside PRIVATE SHOWER at Waters Edge. the home is delightfully situated on a cul-de-sac and surrounded by water on 3-sides. Every window has a magical water view! And the long views, especially around sunset, deserve a glass of wine. At nite you can actually see the Milky Way. Well furnished, this upside-down house has the kitchen and dining areas facing the West, upstairs, next to an expansive deck, and water all around. Simply delicious. The near-by access to the well-kept pool, and short walk to a pristeen ocean beach are very comfortable. The owners have thought of everything including several beach buggies, high chair, pack-n-play, etc. Thanks for making our family dreams come true at Waters Edge. Spent a wonderful week at this lovely house! Plenty of room for three generations to enjoy! We definitely hope to return! Thanks Grammy K. We have many intergenerational guests enjoy the all-important Summer get togethers at our home away from home. Hope the grandkids enjoyed themselves too. Water's Edge was the perfect relaxing stay for our adult extended family. Plenty of privacy and space for 4 couples to congregate and also enjoy quiet time. This house provided just what we wanted -- fabulous views, quiet, peaceful, with everything we needed nearby (the beach, grocery store, gym to work out) and a community pool within the development. The house has everything you need, especially in the kitchen. Windows and views that won't quit, what a great way to spend a week. It was our first time at Bethany after many years going to the Outer Banks and we will definitely come back! We are so glad you enjoyed the area. It's daunting to vacation somewhere else with hopes of finding all the "vacation wants" one requires. Again, we appreciate your pertinent questions and hope we satisfied them. Please feel free to drop a line and as they say in the South, "Come on down..."
The home is well kept. The views are absolutely breathtaking. The gated community gives you a sense of security. It's all very quiet and peaceful. The beach is only a short drive away. There are several flights of stairs to get around the house so I wouldn't recommend for people with mobility issues. For our family it did not pose a problem but I thought I should include into the review. We had a great time. Great Home for a family! It was our first time at Bethany Beach and we had an amazing time. We have three young children ages 6,5, and 2 and this was a wonderful house for them in an ideal location. The sunsets are amazing and the bedroom layout was perfect for the little ones. The kitchen and deck is large enough to accommodate a large family. We were at the beach every morning by 10am and back home for lunch and naps and at the pool in the afternoon. The community pool is excellent. The location is great to restaurants and food shopping and a short drive to the Bethany Beach boardwalk. Try Matt's and Blue coast grill for great seafood but make sure you go before 6pm if you have young children or you will have to wait at least 30mins or more. The owners are very helpful with any questions you may have and reachable via email or phone with a great response time. I would highly recommend this house for large families with young children. Thanks again for an amazing week. ACTIVITIES ON-SITE: Home surrounded on 3-sides by tidal Beach Cove, in this private 21-home gated executive community, which offers a private pool and tennis/basketball court. Cruise the bay in your kayak or raft. Crabbing, clamming, fishing, and bird watching where the birds fly up to greet you. Biking and hiking are yours for the asking. Or just relax, eat, read, sleep, sun and sip while you enjoy the panoramic view high perched high up on the Captain's Walk. ACTIVITIES NEARBY: Short walk to the fine sandy beach for swimming and surf fishing, wander for miles in the adjacent DE Seashore Park. Numerous golf courses, bike paths, three boardwalks, and superb dining in 2 states. Tax-free outlet shopping/antiquing. Ocean and bay watersports - charter boat fishing, wind-surfing. Touring all around. Local watersports: swimming, crabbing, clamming, boating, kayaking, jet skiing, sailing, sport-fishing, beachcombing, surfing, shelling, windsurfing. Salt Pond Golf Club, Semi-Private, 400 Bethany Loop, Bethany Beach; Bear Trap Dunes Golf Club, Semi-Private, Central Ave, Ocean View; Bethany Bay Golf Club, Public, 2 Lee Ln, Millville; Cripple Creek Golf & Country Club, Private, 29494 Cripple Creek Drive, Dagsboro; The Peninsula, Private, 26937 Bay Farm Road, Millsboro; Links At Lighthouse Sound, Semi-Private, 12723 Saint Martin's Neck Rd, Bishopville; Ocean Pines Golf & Country Club, Private, Clubhouse Dr, Berlin; Baywood Greens, Public, Long Neck Rd Off Route 24, Long Neck; River Run Golf Course, Semi-Private, 11605 Masters Ln, Berlin; Pine Shore Golf Course -Dogwood-Pines, Public, 11285 Beauchamp Rd, Berlin; and more. Ski: Water skiing available as well as other summer water sports in the river, bay or ocean. 2019 Season Weekly Rates range between $2,790 to $5,570. Please call 267.252.0597 for details. FLEXIBLE MINI-WEEK -- 5-days/4-nights weekend are available in off-season *OR* 4-days/3-nights weekend are available in off-season Call 267.760.5145 for details. Private getaways or business retreats. Very family-friendly and located in a gated executive community. Vacation rental rates available weekly during July, August, September and October for memorable family reunions. Make unforgettable memories with your kids.